We’ve been with Magento since it’s very beginning and we watched it grow and we grew with it. Somewhere in the second half of 2007, Magento started growing attention of ecommerce community. 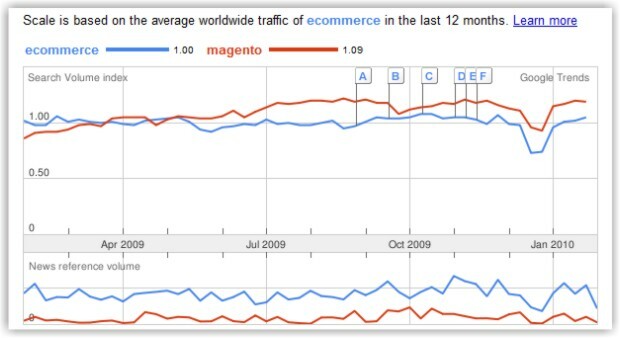 Today, according to Google trends, Magento is more popular than ecommerce itself. 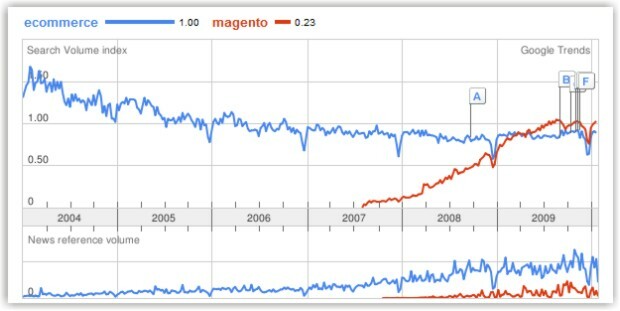 Somewhere in March of 2009 – less then a year ago – terms “magento” and “ecommerce” became equal and from there on, Magento took the leading position. Of course, this is not the whole truth, since ecommerce is used in many synonym forms such as “e-commerce”, however, Magento is still much stronger keyword then any of these synonyms individually. If you look at the curve from the marketing perspective, you will notice that Magento shows significant and stable growth rate with no sign of decreasing or stagnating any time soon. The graph at the bottom shows us there is significantly bigger amount of articles (or news references) about the term “ecommerce” then there is about “magento” and despite this, Magento still manages to attract more search traffic. 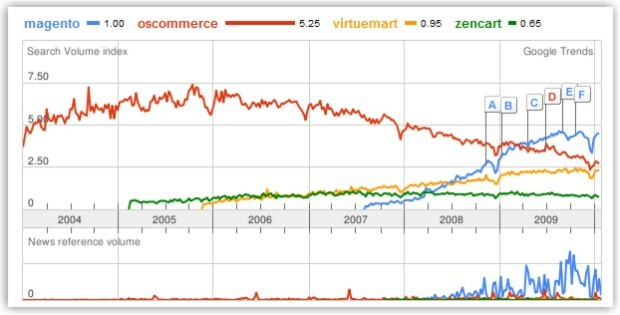 If we compare it to the competing platforms (Magento vs oscommerce vs virtuemart vs zencart) the graph shows us the clear winner is once again – Magento. Tomislav wrote about similar topic long time ago (What’s the best shopping cart). Interesting set of charts, they confirm my beliefs, I always thought that Magento was the premier eCommerce platform. I have been doing Magento since last 8 months only, but it has brought lot many good things in my professional career. Magento is really number the best ecommerce web platform! That’s why at Magento Technologies, we only endorse development services for magento.